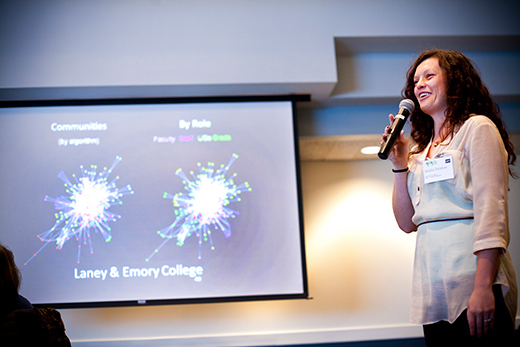 Student leaders presented information about the Emory Sustainability Ecosystem interactive map during a Feb. 10 meeting in Winship Ballroom. A new, web-based map will help members of the Emory community connect with the University's sustainability network of over 700 staff, faculty and undergraduate and graduate students. After three semesters researching and mapping the university's sustainability network of over 700 staff, faculty and undergraduate and graduate students, the Graduate Sustainability Group (GSG) has launched an interactive Emory Sustainability Ecosystem map. "One of the challenges we have encountered is that people don't know what projects are available," says Ioulia Fenton, a PhD student in anthropology and GSG president. "We hope this map can help students see the broad range of opportunities already in existence, and motivate them to get involved or collaborate with others so that their goals can have a bigger, shared impact." "Through the map, anyone can see all the great work that's being done at Emory with sustainability," notes Ciannat Howett, director of Emory's Office of Sustainability Initiatives. "The Emory Sustainability Ecosystem will allow community members to build on existing relationships and connections, or create new ones."